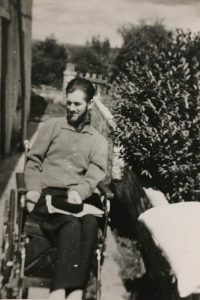 Commonweal was founded by a single activist, David Hoggett, in the 1950s. David was a remarkable man with a passion for social justice. He overcame many obstacles to develop a lending library of peace and nonviolence materials, which he called the Commonweal Collection. David chose this name for his library because it was the nearest English-language equivalent to the Gandhian idea of Sarvodaya – ‘well-being for all’. The Collection covers nonviolence theory and practice, peace, disarmament, environmentalism, human rights, development, anti-racism, social and economic alternatives, creative education, and more. It has its own classification system. Since the 1970s, the Collection has had a home at the University of Bradford’s JB Priestley Library (UK), and it’s used by students from Peace Studies and other courses as well as the general public. If you can get to Bradford, you can join Commonweal and access the Collection free of charge. Commonweal items are listed on the JBP catalogue (choose ‘Commonweal Collection’ from the drop-down menu). Also, archival material collected by Commonweal over the years, from the peace and other movements, is expertly curated by Special Collections at the University of Bradford. 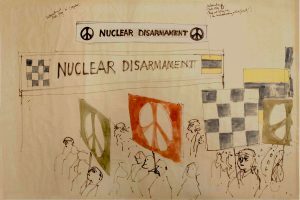 This material includes Gerald Holtom’s original designs for the nuclear disarmament (ND) symbol, which ‘continues to be used as shorthand for peace and hope’. Other successful Commonweal projects over the years include a mobile children’s peace library and a local peace directory. Read more about David Hoggett and the history of Commonweal. Commonweal holds regular peace lectures in Bradford and also now shares resources for activists online, here and on Facebook, Twitter and Instagram. In the same spirit that led David Hoggett to found Commonweal, we are always looking for new ways to support people who want a nonviolent world and who are willing to work for one. Suggest a resource for the Commonweal Collection. Tell us about your nonviolence initiative so we can shout about it online. Offer to write a guest blog for us. The Commonweal Trust is a registered charity (no. 1053157).